The 155th Pennsylvania Volunteer Infantry was organized in September 1862 and mustered out in June 1865. They fought in many of the major battles of the eastern theater including Fredericksburg, Gettysburg, The Wilderness Campaign, Laurel Hill, Cold Harbor, Spotsylvania, Petersburg, and Appomattox. As a reward for their excellence in learning the special drill style of the French zouaves, the 155th was issued zouave uniforms in early 1864. The regiment went on to serve in the 1st brigade of the 1st Division, of the 5th corps along with the 140th NY and the 146th NY in what became known as the Zouave Brigade commanded by Gen. Romeyn B. Ayres. The last casualty in the Army of the Potomac was William Montgomery, a 16-year-old private in the 155th PA who was killed shortly before Lee’s surrender at Appomattox. 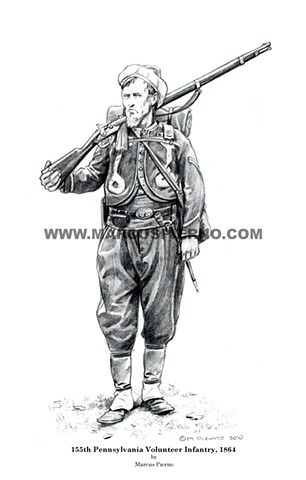 This pencil drawing depicts a corporal in the 155th PA as he would have appeared in the campaigns of 1864/5.